Some films reach “cult classic” status by accident, as their campiness or incompetence elevates them. Others intentionally shoot for this territory, and in that category resides 1978’s Attack of the Killer Tomatoes. Across the USA, a rash of assaults committed by tomatoes threatens the public safety. Publicly, the White House denies the existence of this menace, but behind the scenes, the President (Ernie Meyers) puts together a team to deal with the murderous fruit. At the head of this squad, Mason Dixon (David Miller) takes on the investigation. This leads Dixon and his colleagues on a battle to save the world from tomato-led decimation. 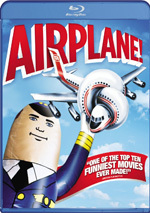 The film’s trailer touts Attack as “perhaps the funniest film ever made”. Perhaps – but almost certainly not, as the movie struggles to generate laughs. And by “struggles”, I mean I didn’t muster a chuckle once during its 83-minute running time. Heck, the material didn’t even manage to prompt a grin, as Attack boasts the lowest of all possible lowest common denominator stabs at humor. Attack follows the same path as 1980’s Airplane! in which the plot exists as little more than an excuse to throw as much attempted comedy at the wall as possible. Given the rapid-fire nature of the movie’s jokes, it seems logical that a few should stick, but they don’t. Instead, Attack comes across as relentlessly stupid. Every once in a while, the gags feel like they should connect, but they never do, as the film’s relentlessly amateurish feel impairs it. Granted, an effort like Attack should come with a cheap, unpolished impression, as it intends to spoof “B” movies. However, to pull off the comedy, the project needs some form of cleverness, wit and skill. In other words, a parody of an amateurish production can’t be amateurish itself – it requires actual skill to seem like a mockery and not just a piece of junk. Unfortunately, Attack appears to boast little actual talent, so the result feels inept. The movie comes across like a project created by kids with too much time on their hands and too little skill. As noted, Attack did attain cult status, but I can’t find anything to enjoy here. The movie comes across as a self-conscious attempt at hilarious parody that fails to display actual humor or wit. Attack of the Killer Tomatoes appears in an aspect ratio of approximately 1.85:1 on this Blu-ray Disc. Though not a terrible presentation, the image lacked consistency. Sharpness became one of the variable elements. While much of the movie showed reasonable delineation, a fair amount of softness interfered as well, primarily during wider shots. Still, the film usually came across with acceptable delineation, and I saw no jagged edges or moiré effects. Edge haloes remained absent, but print flaws turned into a persistent distraction. These never became heavy, but the image showed a fair number of specks and marks. Colors appeared mediocre. At times the hues demonstrated a bit of pop, but they usually came across as somewhat flat and dull. Blacks seemed reasonably dense, while shadows offered acceptable delineation. Even given the movie’s age and origins, this felt like a mediocre image. Similar thoughts greeted the PCM monaural soundtrack of Attack, as it betrayed its roots. Music sounded thin and strident, and effects fell into the same category, as those elements lacked range or impact. Dialogue remained intelligible but also tended to appear somewhat tinny, without a real natural impression. A little distortion crept into the proceedings at times as well. Again, this seemed like an acceptable mix due to the limitations of the source, but it never fared better than that. This Blu-ray comes with a mix of extras, and we launch with an audio commentary from director/co-writer John De Bello, creator/co-writer Costa Dillon and actor/co-writer Steve Peace. All three sit together for this running, screen-specific look at the project’s roots, story/character areas, cast and performances, sets and locations, effects, and budgetary issues. At times, the filmmakers offer some decent notes. However, they mostly just name actors and make jokes. This isn’t a bad listen but the track lacks much insight. A mix of video elements follow, and we begin with Legacy of a Legend. It goes for 14 minutes, 14 seconds and features De Bello, Dillon, Peace, LA Times movie critic Kevin Thomas, fan Kevin Sharp and actors Jack Riley, John Astin and DJ Williams. “Legacy” covers aspects of the production as well as its release and afterlife. This seems like a scattered, disjointed piece that throws out a few useful details but mostly doesn’t go anywhere. Next comes the three-minute, 39-second Crash & Burn. It offers notes from De Bello, Riley, and an unnamed helicopter pilot. They discuss a stunt gone wrong in this mildly informative piece. Two clips appear under Super-Duper 8 Prequels: Attack of the Killer Tomatoes (17:36) and Gone with the Babusuland (32:29). The first provides a 1973 Super 8 version of Tomatoes, while Gone offers a 1970 effort by the same filmmakers. The 1973 Tomatoes seems even more amateurish than the 1978 edition, and Gone follows the same path, though it tells a different story, of course. Neither offers much actual entertainment value, but they’re fun for fans to see for historical value. We can view the 1973 Tomatoes with or without commentary from De Bello, Dillon and Peace. The silent Gone comes with commentary that can’t be deactivated, an awkward choice. While it lacks dialogue or effects, the presentation includes some music, so it’d be preferable to get the option to play the film without commentary. As was the case with the feature version, De Bello, Dillon and Peace tend to joke around too much, especially during the 1973 film. They prove a bit more informative about Gone, though. After this, we find Famous Fowl, a two-minute, 21-second chat with the San Diego Chicken as well as notes from De Bello. It’s mostly tongue in cheek and lacks much merit. Three Deleted Scenes fill a total of six minutes, four seconds. An extended intro to Mason Dixon offers the only substantial sequence, and it runs far too long. The other two bring minor tidbits without much value. The scenes come with non-optional commentary from De Bello. He delivers a few salient points, but I dislike the inability to play the scenes with the original audio, as it becomes tough to hear the lines. Another featurette, Killer Tomatomania goes for four minutes, 33 seconds and offers De Bello, Wendy Wilder and some douche in a tomato costume as they wander Hollywood and find out who knows the movie’s title. Though Wilder is hot, this otherwise becomes a waste of time. Where Are They Now? runs two minutes, 51 seconds and tells us what happened to various participants. Some of this tells us facts, while some attempts comedy. It’s not an especially useful program. With We Told You So!, we locate a three-minute, seven-second reel with De Bello, Peace, and Dillon. They discuss the tomato menace as though it exists, so it’s another weak stab at comedy. Sing-Alongs gives us a few clips. “Sidewalk Sing-Along” lets De Bello tell us a little about the theme, and we see those Hollywood passers-by as they croon the tune. It’s another waste of time. The other five follow a more traditional route, as they show the relevant movie scenes accompanied by “bouncing tomato” lyrics. Meh. Finally, Slated For Success takes up one-minute, 56—seconds and honors the film’s “slate girl” Beth Reno. She, Dillon and Bello discuss her job and we see some shots of her from the set. This clip almost becomes interesting – almost. In addition to trailers for Attack and DOA: A Rite of Passage, the set includes two radio spots. The set finishes with a fold-out poster. A second disc provides a DVD copy of Attack. It includes the same extras as the Blu-ray. 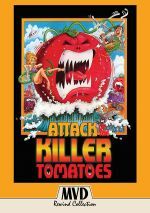 A broad spoof of disaster and horror movies, Attack of the Killer Tomatoes shows no merit. Witless and moronic, the film lacks the cleverness it wants to boast. The Blu-ray offers mediocre picture and audio along with an erratic set of supplements. Attack made me laugh as a kid but it does nothing for me as an adult.